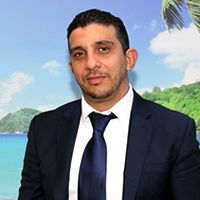 "A romantic island of majestic natural beauty, its Caldera cliffs, drop into the sapphire waters of the Aegean Sea, creating some of the most spectacular scenery in the world. " 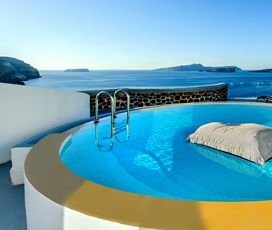 Santorini is unquestionably one of the most beautiful places in the entire world, combining beautiful old whitewashed houses, with gorgeous Caldera cliffs that frame stunning golden beaches. It has a fascinating history, with many historians believing that the volcanic eruption, which precipitated the bronze age collapse of the Minoan civilization, may be the origin of the Atlantis myth. This volcanic eruption defines Santorini’s topography today, causing the soil to be rich and fertile and the formation of many dramatically beautiful rock formations. 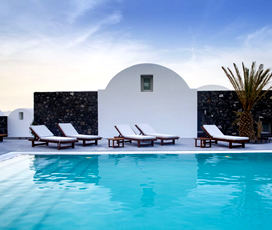 The island’s capital, Thira, sits amidst this scenic beauty where small hotels and restaurants spill over the edge of the caldera, ideal for a romantic holiday. Here one can enjoy a cable car ride all the way to the bottom of the now extinct volcano and back again! To the south east of the island are the seaside resorts of Kamari and Perissa. 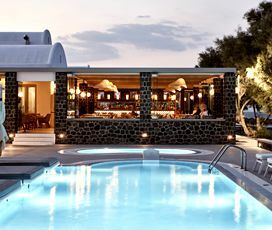 Both have very long stretches of fine volcanic-sandy beaches, water-sports and lively bars and tavernas right along the strip. 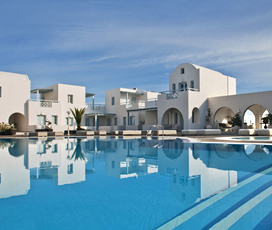 The delightful and historic village of Pyrgos sits high up in the centre of the island. 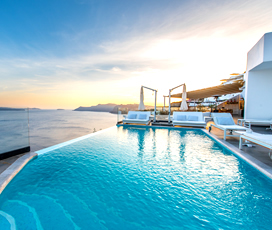 Whichever resort you choose, Santorini is a small enough island that everywhere can be reached within half-hour’s drive giving ample opportunity for exploration! 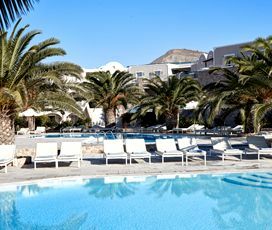 This coupled with Santorini’s vibrant nightlife, exceptional beaches, delicious food and incredible beauty has given it a well-earnt reputation as one of the most romantic islands in the world. However, in truth, it is perfect for everyone, offering everything that you could ever want from a holiday, making it a place that everyone should visit at least once. An archipelago made up of five volcanic islands, it has a circular shape and is surrounded by a sparkling blue ocean lake, located in the Southern Aegean and part of the Cyclades island group, making it ideal for island hopping holidays. It used to be a single island, until a dramatic volcanic eruption caused part of it to sink in 1600 BC, leading many people to speculate that it is the source of Atlantis myths. It encompasses an area of 76 kilometres and has a population of around 16,000, with the most populated area being the capital, Fira. 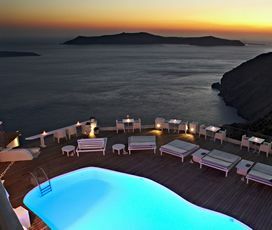 Santorini is unique in European terms, by being one of the few places to only have two seasons (a summer and a winter). This means that the summer lasts longer than on many of its neighbouring islands, making it the ideal destination for sun seekers. The summer usually lasts from March to October, with temperatures ranging from 16 degrees in March to 29 degrees in July and August. 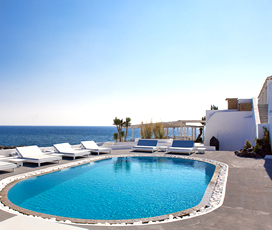 Santorini is also blessed with a cooling summer breeze, ensuring that you will not overheat in the sweltering months of June, July and August. 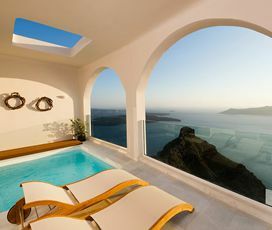 This all serves to make Santorini the ideal destination for a summer holiday. The island fell victim to the huge volcanic eruption of 1500 BC, which was likely responsible for the collapse of the Minoan civilization in Crete and the surrounding islands, with experts believing the resulting tsunamis, were so huge that they reached Crete, 70 nautical miles away. Some experts even believe that the destruction of the island may explain the ancient myth of Atlantis, as the eruption was so big that it caused the island to sink. It was recolonised by the Phoenicians around 1300 BC, before the Lacedaemonians, occupied the island in around 1100 BC. After this it became an important trading base, thanks to its strategic location in the Aegean. The island then passed through Byzantine and Venetian hands, before spending 300 years under Ottoman rule and becoming a member of the new Greek state in 1821. With a rich culinary tradition, it has an array of delicious local delicacies available on the island. Fava, is probably the most famous dish, a yellow spit pea puree, which is severed with olive oil and lemon; Ntomatokeftedes (tomato fritters), are a delicious tomato dish fried in olive oil; Kopania, are a type of sweet, made with raisins and sesame seeds; Melitinia is a traditional sweet cheese pie, which is usually eaten around Easter; Chlorotyri is a local cheese unique to the island, it is sour and creamy; while Santorini is also very famous for its capers, which abound on the island and are used in many dishes. A historic and beautiful place, teenagers and slightly older children are sure to appreciate the uniqueness of the island, on a family holiday. The volcano is a great trip for anyone interested in a combination of geology and beauty, with the dramatic landscape formed by the capricious volcano fascinating. There are also a large number of beaches, with the most family-friendly, Monolithos, combining soft sands and shallow waters. There is also a small waterpark, called Perissa, offering aquatic fun for people of all ages. Discover the island’s natural beauty, stunning Caldera cliffs and beautiful beaches, making it ideal for couples and people who love nature. The volcano is both fascinating and beautiful and is a great day out for anyone who is interested in geology, as is the hiking trail between Oia and Fira, which will take you along the gorgeous cliff edge. Santorini also hosts ancient Thera and ancient Akrotiri for those interested in history, along with a plethora of stunning beaches. 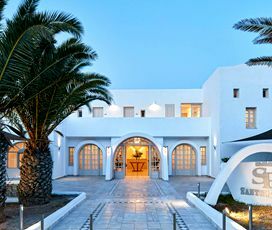 Considered the most romantic destination in the Cyclades there are a myriad of great bars and tavernas, where you can spend a quiet evening, set to a stunning backdrop, with your significant other. However, it is also a great place to party, with Fira, Kamari and Perissa all renowned for the quality of their nightclubs. 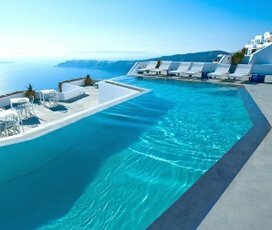 In these places, you will find vibrant clubs, with international DJs, ensuring that Santorini offers nightlife to suit every single taste.